We Spend 90% of Our Time Indoors. Says Who? I’ve been hearing this statistic so much that I started to wonder if it was an urban legend. It’s not! The best reference for the statistic appears to be The National Human Activity Pattern Survey (NHAPS): A Resource for Assessing Exposure to Environmental Pollutants, by Neil E. Klepeis and others, and published by the Lawrence Berkeley National Laboratory in 2001. The survey was funded by the U.S. Environmental Protection Agency (EPA) for reasons that align fairly well with how designers reference it today. “EPA’s main purpose for collecting the NHAPS data was to provide diary records that could be used as inputs for computer-based human exposure models,” says the study. In other words, in order to understand how humans might be impacted by pollutants in our various indoor and outdoor environments, scientists needed to know how much time we spend in various locations. 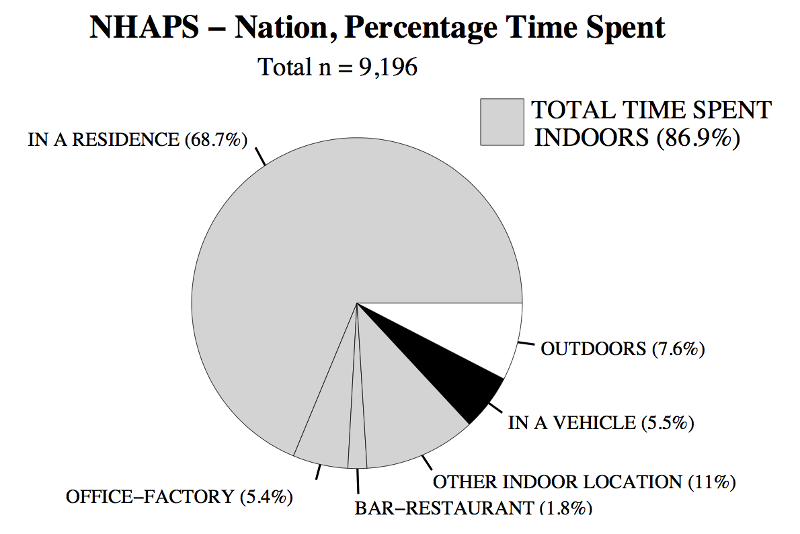 This pie chart from the NHAPS study shows that Americans spend 86.9% of time indoors, plus another 5.5% inside a vehicle. The survey was conducted from late September 1992 through September 1994 by the University of Maryland’s Survey Research Center. The survey used telephone interviews to collect 24-hour retrospective diaries from each respondent. Between 340 and 1,713 respondents were interviewed in each of the ten EPA regions across the 48 contiguous states. Respondents were generally representative of national proportions for gender, age, race, and educational attainment. There are limits to the study: it may not take into account some populations that spend a high proportion of time outside. As the study states, “Those who were away from a home for extended periods (e.g., on vacation or homeless) were not included in the survey. These individuals may be more likely than those who were at home to spend large quantities of time outdoors. On the other hand, there may be positive bias due to neglecting institutionalized and/or hospitalized individuals,” who are indoors 100% of the time. Also, the survey methodology also doesn’t account well for snippets of time spent taking out the trash, walking to the car, or taking a smoke break outside. However, the authors of the study state that they don’t think that these add up to much. 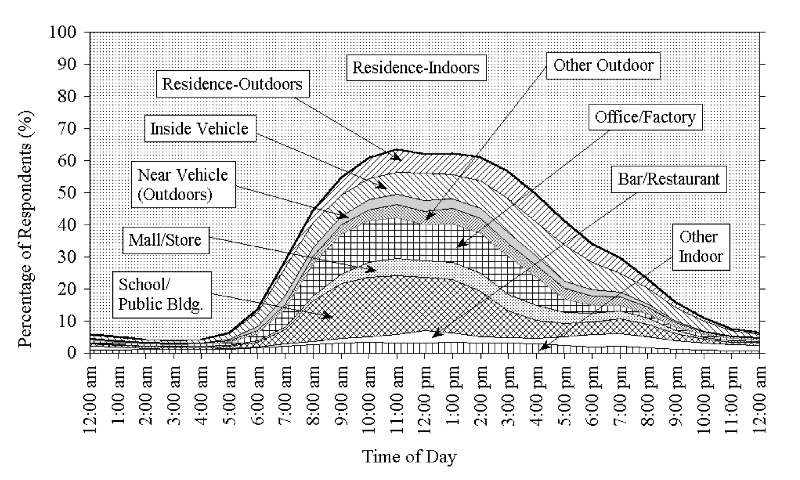 Where survey respondents spend their time, charted over 24 hours. The key figures from the study? Americans spend 87% of their time indoors and an additional 6% in an enclosed vehicle (on average). The study also references previous sociological studies and concludes that the time Americans spend indoors has remained fairly uniform over the previous several decades. These proportions are also fairly constant across various regions of the United States and Canada. 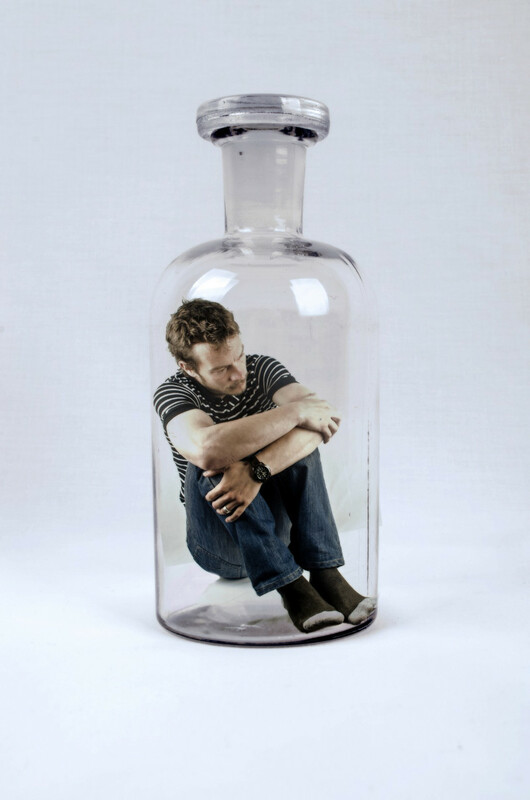 The finding that emerges is that we are basically an indoor species. In a modern society, total time outdoors is the most insignificant part of the day, often so small that it barely shows up in the total.